By the end of 2015, I was kind of…exhausted. It was a long year, but technically it was no different than any other year; it wasn’t like extra days were added, or anything. But health and general life challenges seemed to drag out the year for me, and despite it all I managed to keep writing – slice-of-life essays, novellas, blog posts, and a novel I started in 2014 – which was all exhausting in itself! But I had a goal to finish various projects by the end of the year, namely my novel, and the harder I tried – the more I focused I became on what to/what not to write coupled with the dream of publication pushing me to keep writing – the more stifled I became. My writing became less authentic – less ‘me.’ I was slowly starting to feel that whatever I wrote was becoming stilted, censored, stalled and basically STUCK. Frustration led to reflection and I realized I had to take a step back and change how I write and WHY. I have been a writer most of my life, and most actively in the last fourteen years. And like many other writers aspire to, I have primarily focused on writing for publication, hoping my work is liked by an editor or publisher enough for them to publish my carefully sculpted words. I’ve always written to be read by someone else, hoping my words would entertain, inspire or help. I have been fortunate to have had the professional and personal satisfaction of seeing my work in newspapers and magazines, internationally selling anthologies, and now single title fiction novels. And most importantly I have had readers write to say how much they enjoyed something I wrote, how it made them feel, and how my words – my thoughts and experiences – inspired, helped, or encouraged them. I know a writer’s job is never done – never fully learned – so watching the markets and trends in the publishing world and learning about what readers want and focusing on writing for the readers I want to reach out to, is needed for the publishing world. But constantly doing so, although I am not complaining about the readership I HAVE had, has stifled and stalled my writing a bit, I think. That’s not to say my readers don’t come first, but if I don’t sometimes write simply for me, seemingly and selfishly putting ‘me’ first in my writing, how can my writing be authentic, pure, real and raw for my readers I want to reach out to? I realized that I had been trying too hard. I knew I had lost the freedom to just let go and…write. I knew I had to take a step back and do something to kick start my writing, and get out the writing slump I was slowly finding myself in. So I came up with a plan. I realized that to write, I had TO write. I had to write like no one was gonna read it. Yup – that was my resolution: to write like no one was gonna read it. 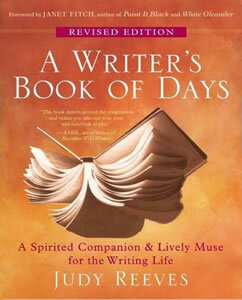 Using Judy Reeves’ book “A Writer’s Book of Days,” I came up with a new writing routine for myself. I am a big believer in routine, but with life’s challenges throwing my routine RIGHT OFF, I had to get back on the horse and get back to writing FOR me if I was gonna kick start my writing for the new year. Sure there are many writing prompt books out there, but this one, for me at least, was perfect. Quick, short prompts, listed by day starting at January 1, along with an accompanying inspiration, advice, encouragement and suggestions for the prompts for that week, were just what I needed. So on a WORD document I typed out the dates and the prompts for two weeks at a time (to add more as I followed along in the book), and every morning for 15minutes ONLY, and with the mindset I wasn’t writing for anyone else but me and with no editing, no backtracking, no over-thinking, and no plans for sending any of the work out there, I got busy. But I took it easy on myself; I gave myself a break. If I only wrote two sentences – fine. If I only wrote a paragraph – fine. If it was more than a paragraph – fine. It didn’t matter what or how much I wrote, but just the fact that I wrote SOMETHING for no other purpose than writing it, was the intention. If I continue this little project through to the rest of the year – fine. If this is only intended to be what I need to fuel my other writing and I eventually stop doing it – fine. NOT that this was ‘bad’ writing, or non-worthy writing, but with my writing time always at a premium, I have to make the most of the time I DO have when I write. I truly do hope I can do both, but I won’t make promises to myself I will worry about not keeping. I don’t want to end up back to where I was – putting more pressure on myself. So here we are, 20 days into the New Year, and I’m still at it. I don’t know what will happen in the future, of where this project of mine will go. So far, though, I think it was just what I needed. I’m feeling creative, re-charged, re-energized, and re-inspired. And heck, I wrote this didn’t I? I won’t go back to my other fiction writing projects just yet, even though I'm itching to. I know I can’t leave them for too long, but at the same time this is the time I need to nurture my writing self. My daily prompt plan might just be the kick start I need if I'm going to write better, freer, and more authentically. I just have to learn to write like no one is gonna read it. For more information, please visit Judy Reeves at her website here. I'll be sure to watch your blog for more posts! Nice connecting on SoMe. I truly appreciate this heart-felt post Lisa. I too, have felt caught up in the turbulence of marketing and writing and watching with envy the productivity of other writers. I remember when I wrote four novels. (Just because) And I felt like a writer and I was enthusiastic and full of joy. Now, not so much. Someone stated something along the lines of 'when passion turns into a job' and my thought was that was rather succinct. I think your writing prompts are a fine way to 'fill the well' as Barbara Samuels has said. Or having a long chat with 'the girls in the basement'. Everyone has a different path, that's for sure. But I do believe we have to embrace our fellow travelers (writers) along the way. Thanks so much for your honesty! Thank you Jodie :) I realized if I was going to move forward, I first had to step back a bit and get back to my writing roots - of writing authentically - if I was going to write better fiction, if that makes sense. This isn't a 'good-bye' to writing, OH NO, it's a stepping back, re-grouping, and then moving forward with a kick start :) Thank you! I love the idea of "nurturing your writer self". Made me remember all those years ago when I dabbled in poetry, horror and romance all for the love of writing. When was the last time I wrote a poem? Thanks for the reminder! BTW if this kick starts your writing - I don't know what to say, I loved Newbie Nick and That Night, both fantastic stories.